H. Oswald Short and his brother Eustace founded Short Brothers in London, England in 1908. In 1916, they became acquainted with duralumin when their firm took over construction of two airships that used duralumin components. Duralumin is an aluminum alloy that incorporates copper, manganese, and magnesium for increased hardness. Fabric and wood were used to build aircraft at the time, but from his experience, Oswald believed that duralumin was a far superior building material for aircraft construction. A duralumin aircraft would be stronger than a wooden aircraft, and it would also be resistant to warping, fire, and rot. Factory photo of the Short Swallow / Silver Streak shortly after its completion in 1920. The aircraft’s riveted construction is evident in this image. Note the cargo compartment in front of the cockpit (between the upper wing’s cabane struts) is covered over. Oswald extensively tested various duralumin-built components with the intent of using duralumin for aircraft construction. Many wondered whether or not duralumin would resist corrosion. To prove the metal was up to the task, Oswald affixed duralumin and mild-steel plates to a jetty so that they were exposed at low tide and submerged in the sea at high tide. After nine months, the duralumin had only light surface corrosion, while the steel plates had nearly rusted away. Reassured of duralumin’s corrosion resistance, Oswald designed an all-metal aircraft in 1919. He sought funding from the British Air Ministry to build a prototype but was turned down because of the unproven duralumin construction. Short Brothers was so confident in duralumin’s merits that in 1920, at their own expense, they began constructing the aircraft Oswald designed. The aircraft was quickly completed and made its debut at the Olympia Air Show in London on 9 July 1920. Originally, the aircraft was named Swallow, but its name was changed to Silver Streak after the show. 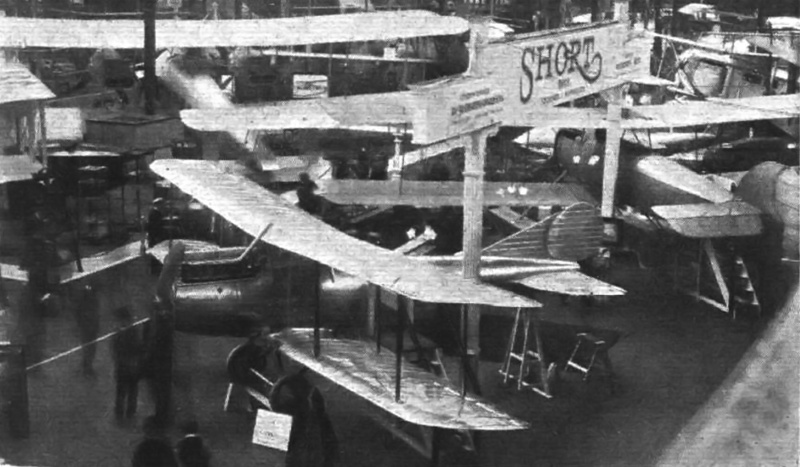 The Short Swallow (later renamed Silver Streak) on display at the Olympia Air Show in 1920, where the polished all-metal aircraft attracted a lot of attention. The Short Swallow / Silver Streak was the first all-metal aircraft built in Great Britain; no wood or fabric was used. The structure of each wing was made up of two steel spars with duralumin ribs sweated on. The wings and tail were skinned with sheet aluminum riveted to their respective frames. The fuselage’s frame had an oval cross section and was made of duralumin. Duralumin sheets were riveted to the duralumin airframe to make up the aircraft’s skin. Thicker duralumin sheets were used around the cockpit, and the front of the fuselage was enclosed by a single duralumin sheet, making a fireproof bulkhead. The Silver Streak was powered by a water-cooled, 240 hp (179 kW), straight, six-cylinder Siddeley Puma engine. The aircraft was designed for a pilot and 400 lb (181 kg) of cargo in front of the cockpit. However, modifications would easily allow the aircraft to carry a passenger in place of the cargo. The Silver Streak had a wingspan of 37 ft 6 in (11.4 m) and a length of 26 ft 5 in (8.1 m). It had an empty weight of 1,865 lb (846 kg) and a loaded weight of 2,870 lb (1,302 kg). The Silver Streak’s max speed was 125 mph (201 km/h), and it had a 450 mile (724 km) range. The Silver Streak made quite an impression at the Olympia show. However, many remained skeptical of its duralumin construction. This skepticism led to the Silver Streak being refused its Certificate of Airworthiness. However, the British Air Ministry agreed to purchase the Silver Streak to evaluate its all-metal aircraft construction. The Silver Streak was first flown on 20 August 1920 by John Parker at the Isle of Grain in Britain. The thin aluminum wing and tail skins were found to lack the needed strength and were replaced with duralumin sheeting. The Sliver Streak took to the air again on 27 January 1921 and was delivered to the Royal Aircraft Establishment at Farnborough in February. During the flight to Farnborough, it was noted that the aircraft cruised at over 120 mph (193 km/h). The Short Silver Streak after its delivery to Farnborough in February 1921. The cargo compartment has been converted to carry a passenger. At Farnborough, the Silver Streak received the Air Ministry serial number J6854 and was flown on a few test flights through June 1921. Testing revealed the aircraft could climb to 10,000 ft (3,048 m) in just 11 minutes and had a top speed in excess of 125 mph (201 km/h). Pilots noted the Silver Streak’s quick acceleration, steadiness in the air, and ease of control. However, the test flying was very limited, and after June the aircraft was relegated to static testing. Nothing was heard of the Silver Streak for over a year, and then the Air Ministry reported that it had tested the aircraft to destruction. During that time, no corrosion issues were encounter with the duralumin. In wing-loading tests, the wing failed just above its calculated ultimate stress level when a spar buckled. However, even with the buckled spar, the wing still possessed enough structural integrity for normal flight. The tail and rudder were separately tested and failed under a load far in excess of what a wooden tail and rudder could withstand. The fuselage survived a 2,000 lb-ft (2,712 N•m) torsion test with no visible distortion. The fuselage was then subjected to 100 hours of vibration tests which revealed no signs of cracks or loose rivets. Satisfied with the results and believing that all-metal construction was sound, the Air Ministry ordered two prototypes of a Short two-seat fighter sea plane in January 1922. Financial concerns caused this order to be cancelled in June 1922. However, the Silver Streak was used as the basis for the Short Springbok, and its construction techniques were employed in future aircraft. A good view of the Silver Streak illustrating how the Siddeley Puma engine was exposed to the airstream to aid cooling. This entry was posted in Aircraft, Between the Wars on 22 April 2014 by William Pearce. What was the next aircraft in England to be made of duralumin? I’m not certain, but I believe the second duralumin aircraft in Britain was the Short Springbok I, a direct development of the Silver Streak. The Springbok I first flew on 19 April 1923. Only two Springbok Is were made and were all metal. The Springbok II (3 made) had a fabric-covered wing and tail.